Plugs and sockets may sometimes combine male and female contacts. Clockwise from top left: CEE 7/4 (German) plug; a matching CEE 7/3 socket with exposed earth (ground) projections on circumference of socket; CEE 7/5 (French) socket with projecting earth pin. Typically no energy is supplied to any exposed pins or terminals on the socket, for safety. A plug is the movable connector attached to an electrically operated device, and the socket is fixed on equipment or a building structure and connected to an energised electrical circuit. The plug is a male connector with protruding pins that match the openings and female contacts in a socket. Some plugs have female contacts that are used only for an earth ground connection. Some plugs have built-in fuses for safety. To reduce the risk of electric shock, plug and socket systems have safety features in addition to the recessed contacts of the energised socket. These may include plugs with insulated sleeves, recessed sockets, or automatic shutters to block socket apertures when a plug is removed. A socket may be surrounded by a decorative or protective cover  which may be integral with the socket. Single-phase sockets have two current-carrying connections to the power supply circuit, and may also have a third pin for a safety connection to earth ground. Depending on the supply system, one or both current-carrying connections may have significant voltage to earth ground. When commercial electric power was first introduced in the 1880s, it was used primarily for lighting. Other portable appliances (such as vacuum cleaners, electric fans, smoothing irons, and curling-tong heaters) were connected to light-bulb sockets. As early as 1885 a two-pin plug and wall socket format was available on the British market. By about 1910 the first three-pin earthed (grounded) plugs appeared. Over time other safety improvements were gradually introduced to the market. The earliest national standard for plug and wall socket forms was set in 1915. Types of power plugs and sockets used by country. Designs of plugs and sockets have gradually developed to reduce the risk of electric shock and fire. Plugs are shaped to prevent finger contact with live parts, and sockets may be recessed. Some types can also include fuses and switches. A third contact for a connection to earth is intended to protect against insulation failure of the connected device. Some early unearthed plug and socket types were revised to include an earthing pin or phased out in favour of earthed types. 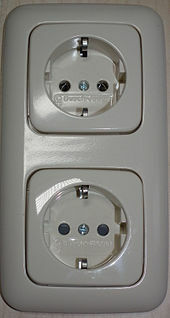 The plug is often designed so that the earth ground contact connects before the energized circuit contacts. The assigned IEC appliance classis governed by the requirement for earthing or equivalent protection. Class I equipment requires an earth contact in the plug and socket, while Class II equipment is unearthed and protects the user with double insulation. Where a "neutral" conductor exists in supply wiring, polarization of the plug can improve safety by preserving the distinction in the equipment. For example, appliances may ensure that switches interrupt the line side of the circuit, or can connect the shell of a screw-base lampholder to neutral to reduce electric shock hazard. In some designs, polarized plugs cannot be mated with non-polarized sockets. Wiring systems where both circuit conductors have a significant potential with respect to earth do not benefit from polarized plugs. 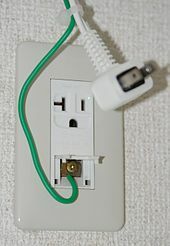 Safety advocates, the United States Army, and a manufacturer of sockets  point out a number of safety issues with universal socket and adapters, including voltage mismatch, exposure of live pins, lack of proper earth ground connection, or lack of protection from overload or short circuit. Universal sockets may not meet technical standards for durability, plug retention force, temperature rise of components, or other performance requirements, as they are outside the scope of national and international technical standards. A technical standard may include compatibility of a socket with more than one form of plug. The Thai dual socket is specified in figure 4 of TIS 166-2549 (shown below) and is designed to accept Thai plugs, and also Type A, B and C plugs. Chinese dual sockets have both an unearthed socket complying with figure 5 of GB 1002-2008 (both flat pin and 4.8 mm round pin), and an earthed socket complying with figure 4 of GB 1002-2008. The exception is that both Thai and Chinese dual sockets also accept 120 V rated plugs, potentially causing an electrical incompatibility because both states use a 220 V residential voltage. A so-called 'universal socket', which meets no standard but is intended to accept a number of different plug types. An earthed Thai socket that appears to comply with figure 4 of TIS 166-2549. Although it may accept NEMA plugs, the Thai voltage is 220 V and thus electrically incompatible with US devices. Chinese dual socket accepting both unearthed 2-pin (upper) and earthed 3-pin (lower) plugs. NEMA 5-15 (type B) plugs with current and voltage ratings shown (left) on label (7 A 125 V) and (centre) on engagement face (10 A 125 V). Also shown (right) is the rating on the C13 connector at the other end of the 10 A 125 V appliance cord. Plugs and power cords have a rated voltage and current assigned to them by the manufacturer. Using a plug or power cord that is inappropriate for the load may be a safety hazard. For example, high-current equipment can cause a fire when plugged into an extension cord with a current rating lower than necessary. Sometimes the cords used to plug in dual voltage 120 V / 240 V equipment are rated only for 125 V, so care must be taken by travellers to use only cords with an appropriate voltage rating. So that manufacturers need not build many similar appliances differing only in the type of plug fitted, a common strategy is to provide an IEC 60320 inlet on the appliance and a detachable power cord (mains flex lead) and appropriate plug. The appliance need only to be tested to the power inlet. Some appliances have a switch for selection of voltage. Extension cords (extension leads) are used for temporary connections when a socket is not within convenient reach of an appliance's power lead. A power strip with multiple sockets may also have a switch, surge voltage protection, or over-current protection. IEC 60309 (CEE 17) "plugs, socket-outlets and couplers for industrial purposes", used as a weather-resistant connector for Caravans, Motorhomes, camper vans and tents for mains hook-up at camp-sites. Special-purpose sockets may be labelled or coloured to identify a reserved use of a system, or may have keys or specially shaped pins to prevent use of unintended equipment. Shaver supply unit for BS 4573, US Type A, Australian two-pin, and Europlug Type C.
National wiring regulations sometimes prohibit the use of sockets adjacent to water taps, etc. A special socket, with an isolation transformer, may allow electric razors to be used near a sink. Because the isolation transformer is of low rating, such outlets are not suitable to operate higher-powered appliances such as blow dryers. An IEC standard 61558-2-5, adopted by CENELEC and as a national standard in some countries, describes one type of shaver supply unit. Shaver sockets may accept multiple two-pin plug types including Europlug (Type C), Australian (Type I) and BS 4573. The isolation transformer often includes a 115 V output accepting two-pin US plugs (Type A). Shaver supply units must also be current limited, IEC 61558-2-5 specifies a minimum rating of 20 VA and maximum of 50 VA. Sockets are marked with a shaver symbol, and may also say "shavers only" . Isolation transformers and dedicated NEMA 1-15 shaver receptacles were once standard installation practice in North America, but now a GFCI receptacle is used instead. This provides the full capacity of a standard receptacle but protects the user of a razor or other appliance from leakage current. 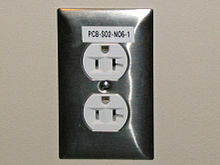 The plugs and sockets used in a given area are regulated by local governments. The International Electrotechnical Commission (IEC) maintains a guide with letter designations for generally compatible types of plugs, which expands on earlier guides published by the United States Department of Commerce. This is a de facto naming standard and guide to travellers. Some letter types correspond to several current ratings or different technical standards, so the letter does not uniquely identify a plug and socket within the type family, nor guarantee compatibility. Physical compatibility of the plug and socket does not ensure correct voltage, frequency, or current capacity. Not all plug and socket families have letters in the IEC guide, but those that have are noted in this article, as are some additional letters commonly used by retail vendors. In Europe, CENELEC publishes a list of approved plug and socket technical standards used in the member countries. The plug and socket system used in Class 1 applications in Argentina is defined by IRAM standards. These two standards are; IRAM 2073 "Two pole plugs with earthing contact for domestic and similar purposes, rated 10 A and 20 A, 250 V AC" and IRAM 2071 "Two pole socket – outlets with earthing contact for 10 A and 20 A, 250 V AC., for fixed installations." 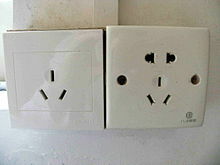 The plug and socket system is similar in appearance to the Australian and Chinese plugs. It has an earthing pin and two flat current-carrying pins forming an inverted V-shape (120°). The flat pins for the 10 A version measure 6.25 by 1.55 mm (0.246 by 0.061 in) and 8.0 by 1.9 mm (0.315 by 0.075 in) for the 20 A version, and are set at 30° to the vertical at a nominal pitch of 7.92 mm (0.312 in). The pin length is the same as in the Chinese version. The earthing pin length is 21.4 mm (0.843 in) for the 10 A version and 21.8 mm (0.858 in) for the 20 A version. On the plugs, the pole length is 18.2 mm (0.717 in) for the 10 A version and 17.8 mm (0.701 in) for the 20 A version. The most important difference from the Australian plug is that the Argentinian plug is wired with the line and neutral contacts reversed. This Australian/New Zealand standard is used in Australia, New Zealand, Fiji, Tonga, Solomon Islands, and Papua New Guinea. It defines a plug with an earthing pin and two flat current-carrying pins forming an inverted V-shape. The flat pins measure 6.5 by 1.6 mm (0.256 by 0.063 in) and are set at 30° to the vertical at a nominal pitch of 13.7 mm (0.539 in). Australian and New Zealand wall sockets almost always have switches on them for extra safety, as in the UK. An unearthed version of this plug with two angled power pins but no earthing pin is used with small double-insulated appliances, but the sockets always include an earth contact. Australia's standard plug/socket system was originally codified as standard C112 (floated provisionally in 1937, and adopted as a formal standard in 1938), which was superseded by AS 3112 in 1990. The requirement for insulated pins was introduced in the 2004 revision. The current version is AS/NZS 3112:2011, Approval and test specification – Plugs and socket-outlets. Brazil, which had been using mostly Europlugs, and NEMA 1–15 and NEMA 5–15 standards, adopted a (non-compliant) variant of IEC 60906-1 as the national standard in 1998 under specification NBR 14136 (revised in 2002). These are used for both 220-volt and 127-volt regions of the country, despite the IEC 60906-2 recommendation that NEMA 5-15 be used for 120 V connections. There are two types of sockets and plugs in NBR 14136: one for 10 A, with a 4.0 mm pin diameter, and another for 20 A, with a 4.8 mm pin diameter. This differs from IEC 60906-1 which specifies a pin diameter of 4.5 mm and a rating of 16 A. NBR 14136 does not require shutters on the apertures, a further aspect of non-compliance with IEC 60906-1. NBR 14136 was not enforced in that country until 2007, when its adoption was made optional for manufacturers. It became compulsory on 1 January 2010. BS 546 plugs. Left to right: 15 A, 5 A and 2 A.
BS 546, "Two-pole and earthing-pin plugs, socket-outlets and socket-outlet adaptors for AC (50-60 Hz) circuits up to 250V" describes four sizes of plug rated at 2 A, 5 A (Type D), 15 A (Type M) and 30 A. The plugs have three round pins arranged in a triangle, with the larger top pin being the earthing pin. The plugs are polarized and unfused. Plugs are non-interchangeable between current ratings. Introduced in 1934, the BS 546 type has mostly been displaced in the UK by the BS 1363 standard. According to the IEC some 40 countries use Type D and 15 countries use Type M. Some, such as India and South Africa, use standards based on BS 546. This plug has three rectangular pins forming an isosceles triangle. The BS 1363 plug has a fuse rated to protect the appliance and its flexible cord from overload and consequent fire risk. Modern appliances may only be sold with a fuse of the appropriate size preinstalled. The United Kingdom, Ireland, and Malta, use the BS 4573 two-pin plug and socket for electric shavers and toothbrushes. The plug has insulated sleeves on the pins. Although similar to the Europlug Type C, the diameter and spacing of the pins are slightly different. The International Commission on the Rules for the Approval of Electrical Equipment (IECEE) was a standards body which published Specification for plugs and socket-outlets for domestic and similar purposes as CEE Publication 7 in 1951. It was last updated by Modification 4 in March 1983. CEE 7 consists of general specifications and standard sheets for specific connectors. 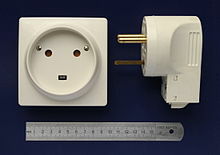 Standard plugs and sockets based on two round pins with centres spaced at 19 mm are in use in Europe, most of which are listed in IEC/TR 60083 "Plugs and socket-outlets for domestic and similar general use standardized in member countries of IEC". EU countries each have their own regulations and national standards; for example, some require child-resistant shutters, while others do not. CE marking is neither applicable nor permitted on plugs and sockets. CEE 7/1 unearthed sockets accept CEE 7/2 round plugs with4.8 by 19 mm (0.189 by 0.748 in) pins. Because they have no earth connections they have been or are being phased out in most countries. Some countries still permit their use in dry areas. Older sockets are so shallow that it is possible to accidentally touch the live pins of a plug. CEE 7/1 sockets also accept CEE 7/4, CEE 7/6 and CEE 7/7 plugs without providing an earth connection. The earthed CEE 7/3 and CEE 7/5 sockets do not allow insertion of CEE 7/2 unearthed round plugs. Two Schuko (CEE 7-3) socket-outlets manufactured by Busch-Jaeger Elektro GmbH, the lower has (black) protective shutters, the upper does not, revealing internal metal contacts. The CEE 7/3 socket and CEE 7/4 plug are commonly called Schuko, an abbreviation for t Schutzkontakt,Protective contact to earth. The socket has a circular recess with two round holes and two earthing clips that engage before live pin contact is made. The pins are 4.8 by 19 mm (0.189 by 0.748 in). The Schuko system is unpolarised, allowing line and neutral to be reversed. The socket accepts Europlugs and CEE 7/17 plugs. It is rated at 16 A. The current German standards are DIN 49441 and DIN 49440. The standard is used in Germany and several other European countries and on other contintents. Some countries require child-proof socket shutters; the DIN 49440 standard does not have this requirement. French standard NF C 61-314 defines the CEE 7/5 socket and CEE 7/6 plug, (and also includes CEE 7/7, 7/16 and 7/17 plugs). The socket has a circular recess with two round holes. The round earth pin projecting from the socket connects before the energized contacts touch. 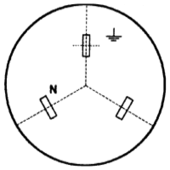 The earth pin is centred between the apertures, offset by 10 mm (0.394 in). The plug has two round pins measuring 4.8 by 19 mm (0.189 by 0.748 in), spaced 19 mm (0.748 in) apart and with an aperture for the socket's projecting earth pin. This standard is also used in Belgium, Denmark, Poland, the Czech Republic, Slovakia and some other countries. Although the plug is polarised, CEE 7 does not define the placement of the line and neutral and there is no universally-observed standard. The CEE 7/7 plug fits in either French or German sockets. The CEE 7/7 plug has earthing contacts to connect to either the CEE 7/3 socket or the CEE 7/5 socket. It is polarised when used with a French CEE 7/5 socket, but can be inserted two ways into a CEE 7/3 socket. The plug is rated at 16 A. Appliances are sold with non-rewireable CEE 7/7 plugs attached. This plug can be inserted into a Danish Type K socket, but the earth contact will not connect. 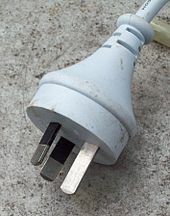 The CEE 7/16 unearthed plug is used for unearthed appliances. It has two round 4 by 19 mm (0.157 by 0.748 in) pins, rated at 2.5 A. There are two variants. Alternative I is a round plug with cutouts to make it compatible with CEE 7/3 and CEE 7/5 sockets. (The similar-appearing CEE 7/17 has larger pins and a higher current rating.) This alternative is seldom used. Alternative II, popularly known as the Europlug, is a flat plug defined by Cenelec standard EN 50075 and national equivalents. The Europlug is not rewirable and must be supplied with a flexible cord. It can be inserted in either direction, so line and neutral are connected arbitrarily. To improve contact with socket parts the Europlug has slightly flexible pins which converge toward their free ends. There is no socket defined to accept only the Europlug. Instead, the Europlug fits a range of sockets in common use in Europe. These sockets, including the CEE 7/1, CEE 7/3 (German/"Schuko"), CEE 7/5 (French), and most Israeli, Swiss, Danish and Italian sockets, were designed to accept pins of various diameters, mainly 4.8 mm but also 4.0 mm and 4.5 mm, and are usually fed by final circuits with either 10 A or 16 A overcurrent protection devices. UK shaver sockets designed to accept BS 4573 shaver plugs also accept Europlugs for applications requiring less than 200 mA.but is otherwise not permitted. The Europlug is also used in the Middle East, Africa, South America, and Asia . This is a round plug compatible with CEE 7/1, CEE 7/3, and CEE 7/5 sockets. It has two round pins measuring 4.8 by 19 mm (0.189 by 0.748 in). It may be rated at either 10 A or 16 A, and may be used for unearthed Class II appliances (and in South Korea for all domestic non-earthed appliances). It is also defined as the Class II plug in Italian standard CEI 23-50. It can be inserted into Israeli SI 32 with some difficulty. The Soviet GOST 7396 standard includes both the CEE 7/17 and the CEE 7/16 variant II plug. 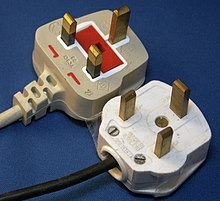 The standard for Chinese plugs and sockets (excluding Hong Kong and Macau) is set out in GB 2099.1‐2008 and GB 1002‐2008. As part of China's commitment for entry into the WTO, the new CPCS (Compulsory Product Certification System) has been introduced, and compliant Chinese plugs have been awarded the CCC Mark by this system. The plug is three wire, earthed, rated at 10 A, 250 V and used for Class 1 applications; a slightly larger 16 A version also exists. The nominal pin dimensions of the 10 A version are: 1.5 mm thick by 6.4 mm wide, the line & neutral are 18 mm long, and the earth is 21 mm long. It is similar to the Australian plug. Many 3 pin sockets in China include a physical lockout preventing access to the active and neutral terminals unless an earth pin (which is slightly longer than the other 2 pins) is entered first. 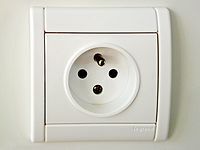 China also uses American/Japanese NEMA 1‐15 sockets and plugs for Class-II appliances; a common socket type that also accepts Europlug (type C) is also defined in GB 1002. The voltage at a Chinese socket of any type is 220 V.
Type I plugs and sockets from different countries have different pin lengths. This means that the uninsulated pins of a Chinese plug may become live while there is still a large enough gap between the faces of the plug and socket to allow a finger to touch the pin. This Danish standard plug is described in the Danish Plug Equipment Section 107-2-D1 Standard sheet (SRAF1962/DB 16/87 DN10A-R). The Danish standard provides for sockets to have child-resistant shutters. CEE 7/3 sockets were not permitted until 15 November 2011. Many international travel adaptor sets sold outside Denmark match CEE 7/16 (Europlug) and CEE 7/7 (Schuko-French hybrid) plugs which can readily be used in Denmark. Socket polarity, with wire colour coding. The two standards were initially adopted because up to the second half of the 20th century in many regions of Italy electricity was supplied by means of two separate consumer connections – one for powering illumination and one for other purposes – and these generally operated at different voltages, typically 127 V single phase and 220 V single phase (from 3-phase 380 V) or two phase (from 220 V 3-phase). The electricity on the two supplies was separately metered, was sold at different tariffs, was taxed differently and was supplied through separate and different sockets. Even though the two electric lines (and respective tariffs) were gradually unified beginning in the 1960s (the official, but purely theoretical date was the summer of 1974) many houses had dual wiring and two electricity meters for years thereafter; in some zones of Lazio the 127 V network was provided for lighting until 1999. The two gauges for plugs and sockets thus became a de facto standard which is now formalized under CEI 23-50. Some older installations have sockets that are limited to either the 10 A or the 16 A style plug, requiring the use of an adaptor if the other gauge needs to be connected. Numerous cross adaptors were used. Almost every appliance sold in Italy nowadays is equipped with CEE 7/7 (German/French), CEE 7/16 or CEE 7/17 plugs, but the standard Italian sockets will not accept the first and the third ones since the pins of the CEE 7/7 and CEE 7/17 plugs are thicker (4.8 mm) than the Italian ones (4 mm); besides the pins are not sheathed and forcing them into a linear Italian socket may lead to electric shock. Adaptors are standardized in Italy under CEI 23-57 which can be used to connect CEE 7/7 and CEE 7/17 and plugs to linear CEI 23-50 sockets. The simplest type, designated CEI 23-50 P 17/11, has a central round hole flanked by two figure-8 shaped holes, allowing the insertion of CEI 23-50 S 10 (Italian 10 A plug unearthed), CEI 23-50 S 11 (Italian 10 A plug earthed), CEI 23-50 S 16 (Italian 16 A plug unearthed), CEI 23-50 S 17 (Italian 16 A plug earthed) and CEE 7/16 (Europlug). The advantage of this socket style is its small, compact face; its drawback is that it accepts neither CEE 7/7 nor CEE 7/17, very commonly found in new appliances sold in Italy. Vimar brand claims to have patented this socket first in 1975 with their Bpresa model; however soon other brands started selling similar products, mostly naming them with the generic term presa bipasso (twin-gauge socket) that is now of common use. Most of North America and Central America, and some of South America, use connectors standardized by the National Electrical Manufacturers Association. The devices are named using the format NEMA n-mmX, where n is an identifier for the configuration of pins and blades, mm is the maximum current rating, and X is either P for plug or R for receptacle. For example, NEMA 5-15R is a configuration type 5 receptacle supporting 15 A. Corresponding P and R versions are designed to be mated. Within the series, the arrangement and size of pins will differ, to prevent accidental mating of devices with a higher current draw than the receptacle can support. Harvey Hubbell patented a parallel blade plug in 1913, where the blades were equal width (US patent 1064833). In 1916 Hubbell received a further patent for a polarized version where one blade was both longer and wider than the other (US patent 1180648), in the polarized version of NEMA 1-15 both blades are the same length, only the width varies. Ungrounded NEMA-1 outlets are not permitted in new construction in the United States and Canada, but can still be found in older buildings. NEMA 5-15 plug, left. "Decora"-style duplex socket, with orientation as specified in NECA 130-2010, centre. Ordinary duplex socket, with orientation typically found, right. Photos are different scale – parallel blades are on 1/2 inch (12.7 mm) centres. The NEMA 5-15 plug has two flat parallel blades like NEMA 1-15, and a ground (earth) pin. It is rated 15 A at 125 volts. The ground pin is longer than the line and neutral blades, so the device is grounded before the power is connected. Both current-carrying blades on grounding plugs are normally narrow, since the ground pin enforces polarity. This socket is recommended in IEC standard 60906-2 for 120-volt 60 Hz installations. In many areas, tamper-resistant sockets are now required in new residential construction, with shutters to prevent contact by objects inserted into the socket. In stage lighting, this connector is sometimes known as PBG for Parallel Blade with Ground, Edison or Hubbell, the name of a common manufacturer. 5-20RA (Canada) or 5-20R (US) T-slot socket mounted with the earth hole up. The neutral connection is the wider T-shaped slot on the right. The NEMA 5-20 AP variant has blades perpendicular to each other. The receptacle has a T-slot for the neutral blade which accepts either 15 A parallel-blade plugs or 20 A plugs. 30- and 50- Amp rated sockets are often used for high-current appliances such as clothes dryers and electric stoves. 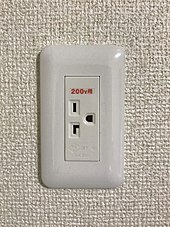 Older Japanese sockets and multi-plug adaptors are unpolarized – the slots in the sockets are the same size – and will accept only unpolarized plugs. Japanese plugs generally fit into most North American sockets without modification, but polarized North American plugs may require adaptors or replacement non-polarized plugs to connect to older Japanese sockets. In Japan the voltage is 100 V, and the frequency is either 50 Hz (East Japan) or 60 Hz (West Japan) depending on whether the customer is located on the Osaka or Tokyo grid. Therefore, some North American devices which can be physically plugged into Japanese sockets may not function properly. The Swiss standard was first described in SEV 1011 (ASE1011/1959 SW10A-R). On 4 December 2009, the TK23 Technical Committee issued the new revised edition of the Swiss standard SEV 1011:2009 for 10-A plugs and 11/12 sockets to provide, among other things, improved protection against contact with partially insulated pins can. 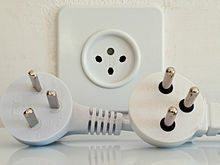 As of 1 January 2013, imports into Switzerland of Type 11 and Type 12 plugs are only permitted with partially insulated plug pins. After the year 2016, only sockets type 13 with a recessed socket hole may be brought onto the market. The type 12 socket has no recess, while the type 13 socket is recessed. Both sockets will accept type 11 and type 12 plugs, and also the 2.5 A Europlug. Earlier type 11 & 12 plugs had line and neutral pins without sleeved pins, which present a shock hazard when partially inserted into non-recessed sockets. A 2012 appendix to SEV 1011:2009, SN SEV 1011:2009/A1:2012 Plugs and socket-outlets for household and similar purposes – A1: Multiway and intermediate adaptors, cord sets, cord extension sets, travel adaptors and fixed adaptors defines the requirements applicable to multiway and intermediate adaptors, cord sets, cord extension sets, and travel and fixed adaptors, it covers the electrical safety and user requirements, including the prohibition of stacking (the connection of one adaptor to another). Non-conforming products must be withdrawn from the Swiss market before the end of 2018. Thai Industrial Standard (TIS) 166-2547 and its subsequent update TIS 166-2549 replaced prior standards which were based on NEMA 1-15 and 5-15, as Thailand uses 220 V electricity. The plug has two round power pins 4.8 mm in diameter and 19 mm in length, insulated for 10 mm and spaced 19 mm apart, with an earthing pin of the same diameter and 21.4 mm in length, located 11.89 mm from the line connecting the two power pins. The earth pin spacing corresponds to that of NEMA 5 and provides compatibility with prior hybrid three-pin sockets, which accept NEMA 1-15, NEMA 5-15 and Europlugs, all of which have been variably used in Thailand. The hybrid socket is also defined in TIS 166-2547, in addition to a plain three-round-pin socket, with plans to replace the former and phase out support for NEMA-compatible plugs. Sockets are polarised (as in NEMA 5-15). The plug is similar to, but not interchangeable with, the Israeli SI32 plug. The Thai plug has not been designated with a letter code at IEC World Plugs, but is sometimes referred to and sold as "Type O". ^ a b c Standard does not define a socket. ^ a b c CEE 7/17 specifies an unearthed hybrid plug that will fit into both the CEE 7/3 and CEE 7/5 sockets. ^ a b c CEE 7/7 specifies an earthed hybrid plug that will fit into both the CEE 7/3 and CEE 7/5 sockets. ^ a b c The recess provided by CEE 7/3 and CEE 7/5 sockets offers protection against touching the live pins of CEE 7/4, CEE 7/6 and CEE 7/7 plugs. When used in CEE 7/1 (unearthed) sockets, or "universal adaptors" there is no protection for those plugs. ^ Type L comes in two variations with ratings of 10 A & 16 A having different pin diameters and spacing from each other. A travel adaptor for "Type M" (16 A SANS 164-1) sockets from South Africa. Adaptors between standards are not included in the standards, so have no formal quality criteria defined. Physical compatibility does not ensure that the appliance and socket match in frequency or voltage. Adaptors allow travellers to connect devices to foreign sockets, but do not change voltage or frequency. A voltage converter is required for electrical compatibility in places with a different voltage than the device is designed for. Mismatch in frequency between supply and appliances may still cause problems even at the correct voltage. Multisocket adaptors allow the connection of two or more plugs to a single socket. They are manufactured in various configurations, depending on the country and the region in which they are used, with various ratings. In Europe for example, they are called double or triple adaptors, and transform one socket into a multiple socket. This allows connecting more than one electrical consumer item to one single socket and is mainly used for low power devices (TV sets, table lamps, computers, etc.). They are usually rated at 6 A 250 V, 10 A 250 V, or 16 A 250 V, however this is the general rating of the adaptor (for example, if we have an adaptor for four sockets and it is marked 16 A 250 V, this means that the adaptor should not be loaded more than 16 A, whether one, two, three or all sockets are used. Some people overload them, thus leading to accidents). In some countries these adaptors are banned and are not available in shops, as they may lead to fires due to overloading them. 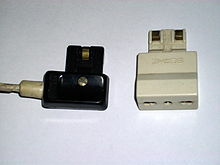 Adaptors can be made with ceramic, Bakelite, or other plastic bodies. For obsolete types, see History of AC power plugs and sockets § Obsolete types. A lampholder plug fits into a light socket in place of a light bulb to connect appliances to lighting circuits. They are used where a wall sockets was unavailalbe. Where a lower rate was applied to electric power used for lighting circuits, lampholder plugs enabled the consumers to reduce their electricity costs. Lampholder plugs are rarely fused. Edison screw lampholder adaptors (for NEMA 1-15 plugs) are still commonly used in the Americas. Unlike the standard BS 1363 plugs found in the UK, the earth pin is on a horizontal axis and the line and neutral pins on a vertical axis. This style of plug/socket was used by university laboratories (from batteries) and the BBC, and is still in use on parts of the London Underground for 110 V AC voltage supply. In the 1960s they were used for 240 V DC in the Power laboratory of the Electrical Engineering department of what was then University College, Cardiff. Power was supplied by the public 240 V DC mains which remained available in addition to the 240 V AC mains until circa 1969, and thereafter from in-house rectifiers. They were also used in the Ministry of Defence Main Building on circuits powered from the standby generators to stop staff from plugging in unauthorised devices. They were also known to be used in some British Rail offices for the same reason. 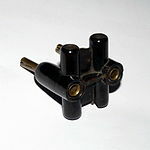 The Italian manufacturer BTicino in the 1960s introduced an alternative to the Europlug or CEI 23-16 connectors then in use. The socket is rectangular, with lateral key pins and indentations to maintain polarization, and to prevent insertion of a plug with different current ratings. Three single-phase general purpose connectors were rated 10 A, 16 A and 20 A; and a three-phase industrial connector rated 10 A; all of them have different key-pin positioning so plugs and sockets cannot be mismatched. The socket is closed by a safety lid (bearing the word ‘’Magic’’ on it) which can be opened only with an even pressure on its surface, thus preventing the insertion of objects (except the plug itself) inside the socket. The contacts are positioned on both sides of the plug; the plug is energised only when it is inserted fully into the socket. The system is not compatible with Italian CEI plugs, nor with Europlugs. Appliances were never sold fitted with these security plugs, and the use of adaptors would defeat the safety features, so the supplied plugs had to cut off and replaced with the security connector. Even so, the Magic security system had some success at first because its enhanced safety features appealed to customers; standard connectors of the day were considered not safe enough. The decline of the system occurred when safety lids similar to the Magic type were developed  for standard sockets. In Italy, the system was never definitively abandoned. Though very rarely seen today, it is still marked as available in BTicino’s catalogue, (except for the three-phase version, which stopped production in July 2011). The plugs and sockets used to power electric stoves from a single-phase line have to be rated for greater current values than those used with three-phase supply because all the power has to be transferred through two contacts, not three. If not hardwired to the supply, electric stoves may be connected to the mains with an appropriate high power connector. Some countries do not have wiring regulations for single-phase electric stoves. In Russia an electric stove can often be seen connected with a 25 to 32 A connector. 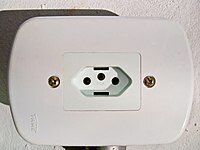 In Norway and parts of Sweden a 25 A grounded connector, rectangular shaped with rounded corners, is used for single phase stoves. The connector has three rectangular pins in a row, with the grounding pin longer than other two. The corresponding socket is recessed to prevent shocks. The Norwegian standard is NEK 502:2005 – standard sheet X (socket) and sheet XI (plug). They are also known as the two pole and earth variants of CEE 7/10 (socket) and CEE 7/11 (plug). ^ John Mellanby (1957). The History of Electric Wiring. London: Macdonald. ^ Sri Lanka Sets National Standard for Plugs and Socket Outlets – Standardized on Type G; sale of non-compliant sockets is banned as of August, 2018, and buildings must re-wire by August, 2038. ^ James S. Jennings. "Army Sustainment: The Three Most Common Electrical Safety Issues in Deployed Environments". Archived from the original on 23 February 2012. ^ "Universal Sockets Are Unsafe". Interpower Corporation. Interpower. Retrieved 6 July 2018. ^ "Universal AC Outlet • Setup Guide" (PDF). Anaheim, CA: Extron Electronics. November 2017. 68-1638-01 Rev. F. Retrieved 21 May 2018. ^ a b c d World Plugs Retrieved on 2015-03-27. ^ a b The letter system first appeared in such guides in 1967 (Electric Current Abroad. United States Department of Commerce, 1967. Retrieved on 2013-12-14.) which designated types A 2-pin US, B (BS 546), and C (BS 1363). The 1984 edition (Electric Current Abroad. United States Department of Commerce, 1984. Retrieved on 2013-12-14.) uses the letters A to G in the same manner as they are used today, and the last revision of the print series was in 1998 ( "Electric Current Abroad" (PDF). US Department of Commerce, International Trade Administration (retrieved 9 October 2015). 2002. ). The International Trade Administration of the US Department of Commerce now publishes a web version: Electric Current Worldwide, which differs slightly from the IEC list and from Wikipedia's list at Mains electricity by country. ^ ftp://ftp.cencenelec.eu/CENELEC/TCs/61/PlugsSockets.pdf Plugs and socket types in each CENELEC country, Retrieved 15 February 2012. ^ "Mains Plugs with Insulated Pins. Australian Standards AS/NZS3112:2000 & AS/NZS3112:2004 refer [sic]". Access Communications. 19 April 2007. ^ "Norma ABNT NBR 14136:2002" (in Portuguese). BR: Projeto de redes. ^ "Archived copy". Archived from the original on 5 March 2016. Retrieved 2015-12-01. CS1 maint: Archived copy as title (link) 9) Aquele fiozinho que tem pendurado atrás da minha geladeira, vai desaparecer? ^ "World Plugs". International Electrotechnical Commission (IEC). Retrieved 27 August 2014. ^ BS 1363 (1995), BS 1363:1995 "13 A plugs, socket-outlets, adaptors and connection units", British Standards Institute. ^ BS 4573 (1970), British Standard Specification for two-pin reversible plugs and shaver socket-outlets, British Standards Institution. ^ "IECEE CEE-7 ed2.0". Retrieved 1 March 2015. ^ "IEC/TR 60083: Technical Report" (PDF). Retrieved 2 March 2015. ^ "International electrical standards and regulations" (PDF). Legrand. pp. 14, 22, 30. Retrieved 16 November 2015. ^ "International standardization of electrical plugs and socket-outlets for domestic use". CH: IEC. Retrieved 20 May 2017. ^ "When Less is More..." ZA: Crabtree. Archived from the original on 6 July 2010. ^ "SANS 164 standards: a working group perspective" (PDF). ZA: EE publishers. Archived from the original (PDF) on 20 March 2012. ^ a b "SI 32 standard Israeli plugs and sockets". PlugSocketMuseum.nl. Retrieved 8 June 2018. ^ "SI 32 part 1.1, draft, 3/2013. Figure #203" (PDF). The Standards Institution of Israel (in Hebrew). p. 14. Archived from the original (PDF) on 6 November 2014. Retrieved 19 September 2015. ^ De Cesco 1975, pp. 70–71. ^ De Cesco 1975, pp. 56–57. ^ De Cesco 1975, p. 93. ^ "Bestreben Nach Sicherheit | Vimar". Vimar.de. Retrieved 12 March 2013. ^ "Electricity in Japan". japan-guide.com. 2015. Retrieved 19 September 2015. ^ Alice Gordenker (19 July 2011). "Japan's incompatible power grids". The Japan Times. Retrieved 3 September 2015. ^ "内線規程　改訂のポイントの解説ページ". Archived from the original on 24 January 2012. ^ a b "Plug Type J" (official site). Geneva, Switzerland: International Electrotechnichal Commission IEC. Retrieved 26 May 2017. Type C plugs are perfectly compatible with Type J sockets. ^ "SEV 1011:2009, Plugs and socket-outlets for household and similar purposes" (PDF) (official site). Fehraltorf, Switzerland: Electrosuisse, SEV Verband für Elektro-, Energie- und Informationstechnik. 2009. Retrieved 26 May 2017. ^ a b c "Information SEV 1011 – power socket/plug/connector" (PDF) (official site). Fehraltorf, Switzerland: Federal Inspectorate for Heavy Current Installations ESTI, Swiss Confederation. 1 August 2011. Retrieved 26 May 2017. ^ "SEV 1011:2009/A1:2012, Plugs and socket-outlets for houshold [sic] and similar purposes – A1: Multiway and intermediate adaptors, cord sets, cord extension sets, travel adaptors and fixed adaptors" (PDF). Fehraltorf, Switzerland: Electrosuisse, SEV Verband für Elektro-, Energie- und Informationstechnik. 2012. Retrieved 26 May 2017. ^ Dario Marti, Director (March 2013). "Plugs and socket-outlets for household use and related purposes: New product requirements for the Swiss market" (PDF) (official site). Fehraltorf, Switzerland: Federal Inspectorate for Heavy Current Installations ESTI, Swiss Confederation. Retrieved 26 May 2017. ^ "TIS 166-2549 (2006) (English): Plugs and socket-outlets for household and similar purposes : plugs and socket-outlets with rated voltage not exceeding 250 V" (PDF). Archived from the original (PDF) on 7 July 2016. ^ Thai Industrial Standard 166-2547: Plugs and socket-outlets for household and similar purposes: plugs and socket-outlets with rated voltage not exceeding 250 V (PDF) (in Thai). TH: Thai Industrial Standards Institute. ISBN 974-9815-94-7. Archived from the original (PDF) on 26 April 2012. Retrieved 23 November 2011. ^ "Power plug & outlet Type O". WorldStandards.eu. 31 October 2017. Retrieved 29 May 2018. ^ "OREI Thailand Travel Plug Adapter – 2 USA Inputs – 3 Pack – Type O". BombayElectronics.com. Retrieved 29 May 2018. ^ "Check your need for a travel adapter!". Power-Plugs-Sockets.com. Retrieved 2 June 2018. ^ "Thai – Power Cords". InternationalConfigurations.com. Retrieved 2 June 2018. ^ "Every International Outlet, in One Handy Chart". GearPatrol.com. 6 February 2015. Retrieved 2 June 2018. ^ "Non-standard BS 1363 types". Museum of Plugs and Sockets. Retrieved 19 September 2015. ^ a b De Cesco 1975, p. 73. ^ De Cesco 1975, p. 75. ^ "La ricerca della sicurezza. Il brevetto Sicury". www.vimar.eu. Retrieved 12 February 2009. ^ "Il Classico Dell'Installazione Civile" (PDF). bticino.assetbank-server.com. Retrieved 20 May 2017. Wikimedia Commons has media related to Mains connectors. This page was last edited on 20 April 2019, at 09:09 (UTC).